A quick note to start off the new internet year. This is usually the strongest season for internet media: the period from the return to school in September through to the big tech shows in January. And we have a particularly good base this year — because last month was excellent. It’s not that we benefited from any gigantic stories. The top 10 are the usual mix of helpful (how to opt out of Facebook Places) and surprising (Greek statues were tacky, Justin Bieber sounds cooler slowed down) and gratuitous (yet more athlete dong.) Take a look through the whole list of the Top 100 (linked below) for more examples of stories that struck a nerve. But it seems that — even if there were few home runs — you were scoring more singles. Most sites were substantially up on a year ago. The US audience of Jalopnik, Jezebel, Gizmodo, Gawker, Lifehacker and Kotaku all grew by 30–60%. And a special mention to io9, which was up 118% on August 2009. The network as a whole drew 17.8m domestic visitors for the month. Let’s put that in context. How do we stack up, against the established names in online news. Last time we measured ourselves against the traditional newspapers’ online operations, we were fourth. 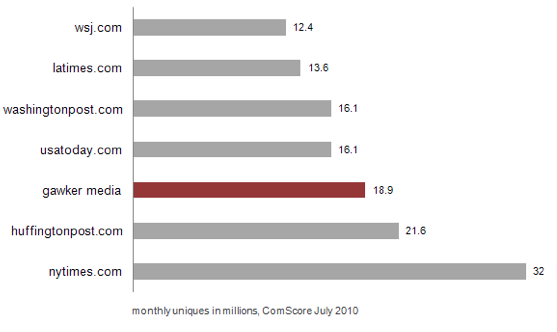 But we’ve overtaken both the Washington Post and USA Today, according to Comscore. And, in this category, we’re behind only the New York Times. A note of caution, however: the newspapers are now the least of our competition. The inflated expectations of investors and executives may one day explode the Huffington Post. And Yahoo and AOL are in long-term decline. But they are all increasingly in our business. And we have a long way to go before we can surpass them. One other note. We don’t talk about it that much. But advertising sales hit a new record in August — which is usually a rather lackluster month. That’s largely down to the increasingly slick marketing collateral and creative services execution — and tireless salesmanship. But I think we may also be benefiting already from audience growth this year and buzz from stories such as the iPhone 4 scoop.